Navigation payloads being developed by Surrey Satellite Technology Ltd. (SSTL) for the full operational capability (FOC) Galileo satellites have passed the preliminary design review (PDR) by panel including the European Space Agency (ESA), demonstrating that they have a sufficient level of design maturity. 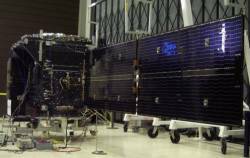 SSTL is teamed with OHB System of Bremen, Germany for the provision of the first 14 FOC satellites. OHB is the prime contractor and builder of the spacecraft platform. Each FOC payload comprises numerous subsystems from specialist European suppliers including two types of atomic clocks, signal generators, high power amplifiers, and antennas. The first of these subsystems are being delivered to SSTL now. The delivery of the first payload is scheduled for late 2011, after which a production line will be started and the subsequent payloads will be delivered at six-week intervals. SSTL will soon begin work on the Galileo engineering model payload, which will provide early evidence of the FOC payload’s capabilities in support of the satellite critical design review (CDR) which is scheduled for later summer 2011. A secure cleanroom in SSTL’s new technical facility, due for completion in May, will be used to test and integrate the engineering model and the FOC payloads.